I started in photography with a Minolta X700 in 1978. The day finally came when set aside my trusty camera for the sexiness of digital with the Nikon 950. I didn’t actually get rid of my Minolta because I loved it so much. Time marched on and I went through a series of point and shoots but I got back to my SLR (Single Lens Reflex) roots with the Nikon D40. I was seduced by Bart and Kirschen getting the Nikon D5100 eventually and with Dorothy standing behind me urging me to upgrade so she could buy my D40, it was an easy choice. Knowing that your camera is going to a loving home makes the decision easy. I think we develop emotional attachments to our cameras because it was through the camera’s eyes that we’ve witnessed the events in our lives, so they’re a part of that experience. Or maybe I’m just weird that way. I had Chris Marquardt from tipsfromthetopfloor.com on the show about a year ago to talk photography with me and I grilled him about these new fangled mirrorless cameras. He talked me out of thinking about them, mostly because they were slow to focus at the time. But then David Allen (@wizardgold) came on my show while we were in New Zealand and he spoke of the wonders of mirrorless cameras like the Sony NEX-6. He didn’t just push the idea, he continuously shows these amazing photos he takes on Google Plus. Then Pat Dengler (yourmacdoctor.com) came over and let me play with her NEX-7 in my own little hands. I was seduced by how small it was and I knew how great the photos were from her and David. However, the Sony menu system seemed confusing to me. I can’t put my finger on exactly why, like a button in the wrong place or strange terminology, but it just didn’t feel intuitive. I had the bug and it was time to start doing some research. My favorite site for comparing cameras is called DP Review, at dpreview.com. You can read full reviews that are really detailed and do side-by-side comparisons of different cameras to help narrow down the options. One problem though is all the different terminologies here that in some cases mean the same thing. For example, micro four-thirds cameras, also called four-thirds, are mirrorless, but all mirrorless cameras are not four-thirds. This makes searching for cameras difficult. I think I tweeted that I was on the hunt, and Steven Goetz (aka @goatman) volunteered to help me spend my money. One of Steven’s best pieces of advice was to make sure that the camera I was considering had a lot of lens options. It never would have occurred to me that because these cameras have different mounts, some don’t have as many options as others. He also told me that the Sony NEX6 while a great camera did have menus that confused some people, so they redesigned the menus for the Sony A6000. Being a Nikon girl, I took a look at the Nikon 1 series. I went to a local store where the guy showed me the Nikon 1 V2, and I really liked how it felt and the menus seemed intuitive. However, he said I shouldn’t buy the V2, because the V3 was coming out any minute now. That created a new problem – when would it be out so I could touch it and play with it? I checked everywhere and they had it for pre-order, with a delivery date of April something, but it was already May and it wasn’t out yet. High ISO numbers like 12,800 – he said this is pure marketing. He said to look at half that a number to get a quality image. That made sense to me but still, half of a bigger number means you can push the ISO further then I would think. Tilt Screens – these are nice for example when you’re in a crowd you can hold the camera above your head to take a picture of a parade, or if you want to set the camera close to the ground you can tilt it up. In my experience being able to flip it around to the front on the D5100 never helped because my lens was so big I could never see the monitor. Never took a single good selfie with it. After all of this great advice on the more obscure features, he did something delightful – he gave me a list of 5 mirrorless cameras he would consider: three Fujis, a Panasonic, and an Olympus. I had the Nikon and Sony I’d been considering already, and I saw some awesome pictures Andy Ihnatko took at WWDC with another Olympus, so I had 8 cameras to compare. Now I’ve got something to work with. I asked DPReview to compare the 8 cameras, and it spit out a plethora of specs for me. As I looked through the giant list of comparisons, I realized that some things were more important to me than others so I created a Google Spreadsheet for the results I cared about. For example, the main reason to make this move is size and weight, but some of these mirrorless cameras can still be a bit big, so volume was a number I calculated in my spreadsheet. 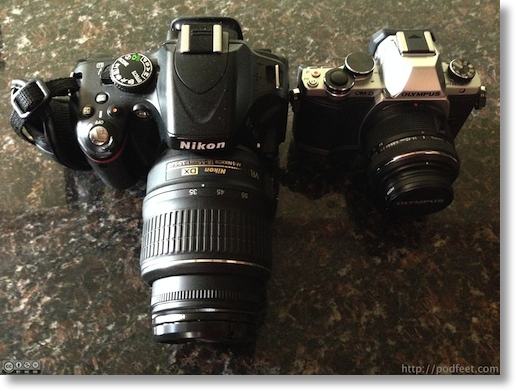 Both the Nikon D40 and D5100 I owned did not have built-in image stabilization. Not a huge deal because you can buy lenses with image stabilization, but you’ll pay more for them. For that reason I considered image stabilization as a criterion as well. I wanted a viewfinder, which knocked out one of the Fuji’s and the Nikon and the Olympus Andy used (plus it was 25% bigger bigger in volume). I won’t go through all the gory details because if you’re really into this you’ll want to pour over the details of the spreadsheet. The final criterion though had to be price. After weighing all the criteria I decided to go with the Olympus OM-D EM-10, which lists for $700 for the body only, but our local store had a Father’s week sale going on where for $800 and no tax you got the camera along with the kit lens, which is a 14:42mm (28:84 equivalent) f/3.5. It’s as wide angle as I like but I want a bigger zoom eventually but that research will have to wait. I believe in buying at brick and mortar stores if you test at brick and mortar stores, so I actually would have been willing to pay a bit more for the camera because my local store let me touch and hold it before plopping down my hard earned cash. I have to say, I fell in love immediately. Where the Sony menu system sings to others, the Olympus menus are much more intuitive to me. No slam on Sony, just that our brains work differently so it’s awesome that we have choice. I have to say there are a LOT of menus on this camera so I can’t pretend I’ve mastered them all but I was able to quickly figure out how to get into Aperture priority, adjust my exposure compensation and all that. The E-M10 is 70% of the weight of the Nikon D5100, but less than half of the volume. This is the reason to buy a mirrorless camera. The camera you can easily carry around is the one you’re going to use. Time will tell on whether I feel I’ve sacrificed much but spec-wise there’s pretty much nothing better about the DSLR vs. the mirrorless camera I’m comparing. Over the years I’ve gotten updates from Apple that refer to Camera Raw support for different cameras, but I never paid any attention to them. Now I care deeply because Apple doesn’t yet support the RAW format from the E-M10. I learned a lot about why this might be by asking questions over in our Google Plus Community. I was confused because the E-M1 is supported and so is the E-M5, so why would the E-M10 have yet a different RAW format. Between Bart, Steven, and George I think I understand now why that might be. I also found in the Apple Discussion Forums, Sokolov Stas posted a link to an EXIF script tool that edits your EXIF data to trick Aperture into thinking the photos were taken on an E-M1 instead of the E-M10. As soon as I ran the script I was able to pull the photos in. He said to navigate to the folder enclosing your photos and run a command I’ve dropped into the shownotes, and presto change, there will be two of each file, one called _original and a new and improved version that Aperture will recognize. I do understand that there may be some funny business with the photos because of this but so far the photos look dandy to me. I’m sure I’ll have more to say over time about the switch to mirrorless and I wanted to give you my decision process here. Hopefully if you’ve been thinking about a mirrorless camera my research will help you. Many thanks to Antonio and Steven for helping me along this path. After a decade shooting with Nikon APS-C cameras – and more than two decades in film, ranging from 4×5 and 120 formats, and a Leica M4P and Canon F1 and T90 – I also made the switch to mirrorless. But was unwilling to go down in sensor size to do so. I chose the Sony A7, and the benefits of going up in sensor size have been equalled by its extraordinary EVF that blows away every focusing system I have ever used. Matching that sensor is its incredibly easy manual focus peaking and ability to tap my full-frame Nikon, and legacy Canon FD and Leica M lenses. No one using a conventional DSLR should fear the mirrorless move. In most cases, you will end up with a Sony sensor and electronics, because they are the leaders and even Nikon uses them. An A7 gives you a full frame sensor for the price of a high end MFT, and within the next 2-3 years, Sony sensor prices are likely to be fully competitive with APS-C camera prices today. In converting from DSLR to mirrorless, I would caution NOT going down in sensor size in lens selection today, no matter what mirrorless you choose. Lenses outlast camera bodies considerably – as testified by the utility of 30 year old Leica rangefinder and Canon FD lenses on my Sony. With adapters, the full-frame lenses you buy today will work on tomorrow’s cameras. MTF lenses will work on MFT sensors – period. Olympus and Panasonic – two financially precarious companiies – are the only ones who’ve embraced MFT, whereas Nikon’s D800 has the same sensor as the Sony A7r. I believe the handwriting is on the wall for small-sensor mirrorless cameras. Enjoy them today, but recognize the limits of lens investments for that format. Thanks so much for the thoughtful comments, Mel. I haven’t yet heard articulated why a full frame sensor is important. Remember I moved from a Nikon D5100 so I never had a full frame sensor in the first place. Calling small-sensor mirrorless cameras DOA might be a bit premature given the large market of small-sensor DSLRs. I was unwilling to go with the A7 for two reasons – the menus were not at all the way I think, and the camera is giant compared to the E-M10. My main purpose was to get a smaller camera, so going with something large defeated the purpose. I also have no desire to hook a giant lens onto my diminutive camera, again defeating the purpose. I’m sure the purists and professional photographers will agree with you and you clearly know a heck of a lot more than I do about this, but for a high end enthusiast I think the small-sensor mirrorless cameras will be quite successful. Remember that market is probably larger than the market for the highest end. The good news is that we can all live in peaceful coexistence and both get what we want! – Smaller, lighter system. My back will thank me. Steven Goetz was my enabler, maybe I can be yours! Look up how much your camera and lenses are worth to see how much cost you could offset? I know what you mean though, it’s heartbreaking to leave something like this that you love behind. A word of warning about DPReview. The specs they have in their camera comparison tool may be incomplete or incorrect. For instance, I compared my current camera and its successor to the D5100 and M10 (just for kicks) and during the comparison noticed one parameter wrong on both Pentax cameras and many missing on my current model. There may well be more inaccuracies I did not spot. You can probably rely on the obvious ones like dimensions and basic features, but if any specific feature catches your eye, I’d recommend researching further. I also found it odd that my current camera was termed a “mid size SLR” versus the “compact SLR” D5100 even though in all three dimensions they were within 3mm of each other – two bigger, one smaller. I guess mine may *just* have gone over a threshold. Finally, and this is more subjective, I have more than once been warned that DPReview are over critical of many cameras and certainly concerns I have had prior to purchase – based on DPReview – have been allayed by actual users. Good warning, Allister. There were several stats I didn’t copy over to the spreadsheet because they didn’t make any sense as comparators. The numbers for video were all mixed up, some were in terms like 1920×1080 but other said 60fps so that’s why that line simply says “yes”. I suspect they have an automated importer and if the file has nonsense or nothing or is mislabeled, it doesn’t work properly. Seriously, comments of others, but your post in particular, have convinced me that sooner or later I’m going to make the jump to mirror less micro 4/3rds. The only killer is the significant investments I’ve made in glass for the D7000. That, and I still love shooting with the damned thing. I just don’t like toting it around. Like computers, tablets, phones, etc….miniaturization is where its at (exceptin’ for screen size, of course!). Thanks for the thoughtful analysis. You’ve done a lot of the heavy lifting for the rest of us wage slaves. Happy shooting with that Olympus. 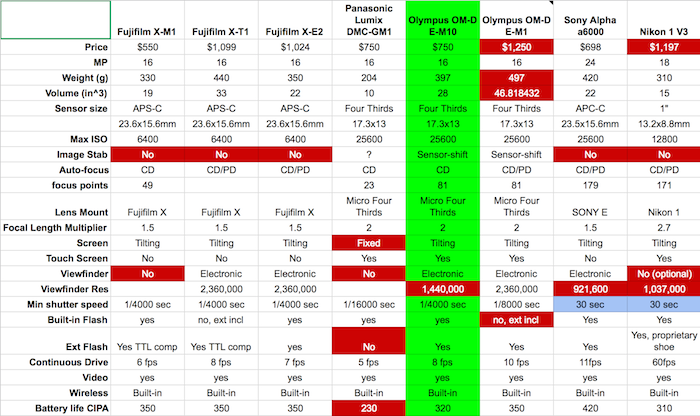 Hi Guys, Here’s another really useful article on DSLR vs. Mirrorless…and a comparison chart for some of the newer mirrorless. Good news — today’s release of Camera Raw Update 5.0.6 includes the E-M10, so there’s no more need to dink with the EXIF settings on your pics. I’m doing a similar shift in cameras, but in the opposite direction. I’ve been using a Canon S5 super zoom for the last 7 years, and figured it was time for something newer. 1) larger sensor — I’m tired of my low-light pics looking like a sandy mess. 2) at least 12x zoom range — multiple lenses I can grudgingly accept. After listening to Allison’s experiences I tried out the cameras mentioned, and found the <a href="http://www.dpreview.com/products/sony/slrs/sony_a6000&quot; Sony A6000 a natural fit. The menus make complete sense to me. Sorry, Allison! Now I have to make a decision between the small 24-75 + 82-315 kit lenses, or a single large 27-300 lens. Seems a difficult decision, and I only have 6 lenses to choose from! Thank you, Allison, for the work you did. It made my own decisions much easier. I saw that Charles – made me so happy! So much less work to do every time I bring in photos. I think it’s swell that the Sony menus work for you. That’s awesome and will be curious how you like the big sensor. I’m super happy with my choice but it certainly doesn’t mean it’s what everyone should do. I had two lenses on my D40 then D5100 forever, and it drove me nuts switching. When I bought the 27-300mm I hardly ever used those lenses again. On the new camera the only wide angle to big zoom I could find right quick was pretty heavy (small compare do DSLR lenses of course, but heavier than my diminutive camera) and very expensive, so for now I opted for the two lens approach. My big zoom is crazy light and only cost me $160 so I’m happy for now till I can find the lens of my dreams! Recently bought the Canon EOS M5 mirrorless camera and I am completely in love. If you are looking for something more compact yet powerful than you might want to consider a mirrorless camera!